We never seriously considered a life of crime. By 'crime' we are not, of course, referring to anything akin to Jack the Ripper nor, indeed, to the Great Train Robbery of 1963, nor to any of the spectacular heists which have become legends in their own right and are documented in the annals of world history. Such things are unacceptable and would, in any event, be quite outside of our league. No, much more, had we decided on this as an appropriate way of earning a living, it would have been a little petty pilfering here and there, the odd spot of light burglary, fencing fakes, printing banknotes or, to use what we understand to be the correct terminology of the trade, dealing in 'knock offs'. We do not have what it takes to be a latter day Bonnie and Clyde. As it is, a strong sense of morality, stemming most likely from strict upbringings where the importance of distinguishing right from wrong was instilled at an early age, and a failure on the part of our schools' careers' guidance teachers to offer it as a possible alternative to university, coupled with the fact that neither set of godparents headed up the local Mafia, meant that such an occupation was never, so to speak, on the cards. And so, apart from the occasional fine for speeding - subconscious practice for being in the getaway car? - and a parking ticket here or there we have, to date, escaped the clutches of the law and anything approaching a criminal record. But not so in our dreams. Or, more accurately, in waking moments when sleep evades or the tedious bus or train journey stretches ahead, moments when time appears to stand still. Then we play the game of robbing our friends' houses. It is quite simple. Enter, in imagination, the house of any friend or acquaintance, and the rules permit the stealing of one, possibly two, objects taken from furniture, paintings, porcelain or anything desirable which happens to come to mind. At times to choose becomes almost impossible as in the case of a London drawing room known to us intimately and where nothing, short of the paint on the walls, is newer than the finest, and earliest, eighteenth century. Rich pickings indeed! Or again, a modest country cottage whose walls carry the most desirable of works by Ben Nicholson and Graham Sutherland. In another instance we quarrel over an entire library of modern fiction. Can we purloin it all? But, be assured, unlike the slightly mad, misdirected May Swift to be found on the pages of Molly Keane's splendid novel 'Time After Time', who pockets a paperweight, among other objets trouvés, your silver is quite safe with us. When may we visit? Now, dear Maggie, do not put ideas into our heads!! But what a very sweet thing to say and so very much appreciated. Jane and Lance, you're on humorous form! I've a feeling you'd be more inclined to want to leave something behind if my house became the subject of your game. Should you require several metres of cable for computer networking, a wooden spoon (or 5), a football, an industrial-sized box of washing powder or some circa 1987 St Michaels dresses - you'd be in luck. Oh Jane and Lance, come and visit the Antipodes any time you like, although you won't find much that is too precious here in the nation's capital. You'd be welcome to take a politician or two home with you though. I'm a great fan of immigration! If you come could you please bring that wonderful book with you. I do love a good read. Ah, but we should be very tempted to steal your most vivid imagination which always comes to the fore in your highly entertaining and very readable posts. Now 1980s M&S dresses! There's a thought. Believe us, Kerry, we should strip the capital bare thus wrecking the Australian economy and forcing your politicians from office in one fell swoop. If you do not already know Molly Keane [or M.J. Farrell which is her proper name], then we highly recommend her novels which are witty, with a kind of black humour, and thoroughly entertaining. It's funny to look around my house (mentally of course- I am far too snug in my armchair to get up and investigate) and try to see it through an outsider's eyes. What would you be tempted to purloin? Well, there are a few paintings of some value under our beds, not there because we fear them being stolen. It is because we don't like them any more. Whatever would it look like, DARLING Jane and Lance, if, after a peremptory poke about you decided there was NOTHING worth nicking from me? I'd be mortified! I'd be stuffing your suitcases with anything to hand, NO EXPENSE SPARED, and, after you'd gone, telephoning all the right media outlets to let them know that AT LAST I'd been robbed by only the best kind of burglars. It amuses us. But perhaps that says it all! Never underestimate anything in life. And from what we have seen from some of your posts we anticipate a very good haul. Walls of books are to us perfection. Now what makes you think that the dog is exempt? Or its bed, come to that. Now, Andrew, could you please be a little more specific about those paintings? And will everything fit into the lift? Steal me, and take me away from all this......... (she wrote looking out a dull November morning). It would be an honour for you to steal my silver if it'd make it into one of your blog posts!! Your game sounds SO much more exciting than any electronic game, but I don't understand the fiction problem. Doesn't one library count as one item??!! DARLING Faisal, what a wonderful comment which has caused us to laugh out loud. But make no mistake, for only recently you gave us a glimpse into your house where a rapid assessment on our part was enough to convince us to book airline tickets immediately. Long about now, what with the economy and job market what it is, I could use one of those special printing presses which prints paper money so expertly; of course I've never thought of this till reading this post. I do have a bit of jewelry but not enough to make taking it to the pawn shop worth while or melting it down for gold. So I guess I'll stick with reading about crimes in novels such as you have suggested in Molly Keane. We do have so many politicians of either pursuasion we'd gladly give up here, if politician is their profession you can have the whole lot of them. But that would be unkind to send them to you or anywhere else, perhaps there's a desserted island where all the politicians from every country can be sent without any planes or boats available for them to escape, nor any phones for them to rule from a distance. Brilliant, brilliant! Just email us your address and we shall be right over. What fun we shall have. Australia is beginning to sound very well worth our while, even considering the distance and our dislike of flying. And yes, why keep this to fiction?!! New rule, as of today, an entire library counts as one item! This, Linda, is an excellent idea and we, doubtless along with many others, would willingly contribute to the cost of exporting the majority of politicians from all countries to a desert island if, even allowing for fiddling their expenses, they are unable to afford the fares themselves. It is, as you suggest, vital that there is no means of escape. I hope you will visit and pilfer most of the leaves that are sprawled over the lawn, I gathered 12 bags this weekend, it's the most awful chore at this time of year. Well, OK. But hands off my cats! Poor you. Leaf gathering is one of the most tedious of garden tasks and does, to a degree, rather put a damper on autumn and all the wonderful colours which one knows only too well will have to be dealt with. Alas, Tabitha, we shall pass on this! I would quite like to steal your jolly good taste! OK, fair deal. But as it happens we find it very difficult to resist any cat. In our view, and clearly shared by you, they are the most wonderful of animals although, of course, fearfully independent. We can see that you are rapidly entering into the spirit of it all. As you say, so very exciting by torchlight which certainly adds a new dimension. May we form a partnership? That is so very thoughtful and so very kind. Thank you. For the right price (about 1/8th of real value) you can get anything stolen these days. You dream could become a reality. Do you know the right people? If so, please put us in touch! In any event, we had whilst mooching around Bath, considered your candlesticks as fair game. We think that in all probability we should wish to appropriate Katinka herself. After that it would be unkind to leave without her favourite items. A lovely post, and what an entertaining game! When considering playing this game myself, I realised that I don't want anyone else's things. In fact I am rather keen to get rid of many of my own things - to an appreciative home, definitely, though. There is of course a core of old and new favourites but so many things are not really used or necessary. Just far too nice or of too much sentimental value to throw away. How we admire your discipline since although we always say that for everything which comes in, at least one item must go out,we never manage to hold to it. A squirrel mentality, perhaps? Thank you so much for the open invitation, if we leave all our principles at the door, who knows what might take place. Such fun, for sure! We are quite certain that you underestimate the attractions of your own house. As for the children, since we have none ourselves, we are sure that we should find them a delight and be very tempted to whisk them away, dog too!! Dear Jane and Lance - what a lovely game to play, only in the head of course. We do something similar with people watching. Wondering who they are, where they come from, what their relationship is, and what they do. This post has put such a smile on my face this morning. What a joy to see the fabulous Ron Moody from the 'Oliver' clip... "Shut up and drink your gin"... those very words, spoken from my mother, are still ringing in my ears! Dearest Jane and Lance, you would be most welcome to visit anytime. But I should warn you, if you wish to take my most priceless possession, you will require a horse trailer! It's such a pleasure visit your blog - not just because your write so well and, in this case, about the most unexpected subjects, but also for the wonderful exchange of comments that follows! We've all know what things we covert from our friends and neighbours, but to take it one step further and imagine stealing it is just brilliant and I ...well, I cackled.. there's no other word for it. I'm glad there was no one here to witness it too - such a raucous sound it was. You've made my morning - thank you. Dearest Abby, much as we should love to steal Spotty, for whom we should not mind the trouble of finding a horse box, trailer, hay, bits, bridles, jodhpurs etc. etc. we could not bear to think of you without him. And so, it will have to be a visit to Northumberland, a county we love, and gin slings all round!!! It all brings to mind the audacious theft of a silver Georgian cow creamer in PG Wodehouse; I'm sure your lightness of finger would be exercised with equal élan and determination. Unfortunately, however, having chatted briefly with my diary secretary, I find I am in fact busy until March, coincidentally the same month as will see the completion of the armed watchtowers on all borders of my sprawling estate, and can only then hope to welcome you to stay with us here. Already I yearn for that day. Oooooh a new game. Yippee!! We shall play it today. Never ones for delayed gratification!!! Thank you so much for your kind comment. We love the eclectic comments, indeed, the brilliance of our readers never ceases to amaze and delight us. Such vivid imaginations, it is all quite frightening! We are so pleased that you enjoy Molly Keane too. The flawed characters and dark humour really appeal to us. Well, I'm afraid that you wouldn't find much that's worth anything in our house......most of our precious things are purley of sentimental value.......now, how would that make you feel when running off with our belongings ?!!!! haha !! Well, March it is then! That should give plenty of time for our Russian friends to smuggle out some light arms [nothing too destructive, you understand]in readiness for storming the ramparts!! We have already decided which room we shall make a beeline for, somewhere where we are not usually found,but the prospect of all manner of homemade goodies would be our driving force. Fancy pancakes, here we come....just the right timing for Shrove Tuesday!!! Too funny Jane and Lance. You are most welcome any time but, be warned, you will be searched before leaving - I know you will try to make off with my hat block (He! He!). You protest too much and your beautifully presented blog offers tantalising delights on every post. No, we should be quite cold-hearted here, and leave with the lot!! Oh, the temptations that must abound in your friend's house.....and will, we wonder, you make your imaginary intentions known? If you came to my place in Taiwan, my friends would all come over with boxes and bubble wrap to help you pack. You are still welcome, though, as you probably won't find it worthwhile to ship the swag back to Hungary. I don't think, however, that you would really enjoy your new career. Simply coveting an object is not what drives true collectors. It is learning about objects, searching them out, and finally negotiating for them that gives the big rush. Oh dear, how well you know us, dear Stephie! Yes, the hat block, most definitely, and the cheeky monkey which we have seen and looked longingly at again today!! How very kind of you to offer a wrap and pack service.We have never been to Taiwan and this would add a most exciting element to the trip! We fear that you may be right about our possible career move, but in some cases we have coveted the items for years, know every detail about them, and have even 'placed' them in our own apartment. Well, that just leaves the negotiation....!!! The monkey is one of my favourite finds - you have great taste! I don't know where my comment on your previous post has gone?! It is indeed a shame about the asbestos but better to forewarned. There is another place out there waiting just for you I am sure. I love your front verandah. I could most happily while away the hours there - so beautiful! A life of crime comes quite naturally to many people. Indeed, I was surprised to discover at about five that the usual way to get glasses was to buy them rather than stuffing them under your grandsons duffle coat as you left the pub. Coming from a family of working class thieves and ruffians, I can only inarticulately describe the wonder at how I would see my father produce, as if my magic, a purloined mango from one of the many poachers pockets of his overcoat (he drove a truck for Sainsburys), or how he never bought a wheelbarrow in his entire life despite owning a succession of them. The best of all though was when he got me out of bed aged ten to go with him in his van from Goucester to Avonmouth on the motorway to steal one slab out of four from every motorway telephone so he could make a patio. Damn! I have blown my cover now! Thanks for a much needed laugh. Getting to know you on these pages makes it very funny to imagine. I did not have the same upbringing. Four years ago, when my mother was ill and in hospital (she's well again), I went through her linen closet and tossed all the purloined hotel towels. I was tired of stepping out of the shower onto "Hilton." I overcame my upbringing, but your post has given me permission to fantasize. Everyone's silver is safe with me, as well. The monkey is so sweet and we love the way that it can be posed into so many different positions. Yes, you would definitely have to hide him away!! Your comment on the previous post is most definitely in there somewhere, we recall it. If the house was meant to be, then all would have been well. We are sure that things happen for a reason. Thank you so much for your kind words about our apartment. With such style as yours we appreciate this very much! Welcome! Well, what can we say. It is not often that we are lost for words but disappearing slabs from the sides of motorways for patio building, ten year old child in tow, had us reeling. And, what exotic tastes you all acquired with purloined Mangoes, well, good food does cost less they say at Sainsbury's!! We have so enjoyed our visits to your blog and hope that we shall see you here again! If I recall, you have a lovely heron under glass, or is that in your London flat? You are in Budapest, is that correct? Kindred spirits indeed, although we did not use this device as a match-making exercise. Perhaps subconsciously we knew that we were suited, but it does sound like a very good way to filter undesirable partners. How lucky your children are to have been taught such ways!!! Well, after your revealing your mother's hotel habits, we must confess to having a penchant for wooden clothes hangers embossed with the names of grand hotels. Sadly, these are becoming rarities now but we always smile as we hang up our suits, skirts and trousers courtesy of The Dorchester. Perhaps we should meet your mother when we visit? Well this certainly made my day! I love that you are so full of surprises like this. You've given me a great idea for a new game that I can play in the wee hours of 3 to 4 am, when I often can't sleep and sometimes turn to dark worrying. This is a much better alternative! Thank you for the wonderful laugh. The Heron is indeed in England, under glass and in a firmly locked apartment where entry is by special code and over which a constant vigil is undertaken by our neighbour. Yes, we are in Budapest! Oh yes, the more players the better! And, on our visit to you,may we please have a look through your wardrobe [so stylish], your husband's wardrobe equally stylish, we are certain] and your kitchen cupboards[always full of tasty goodies]? And, please can you help us pack?!!!!! Hello! I do not know the English very well...I do not understand everything....Interesting post! We are always happy when you drop by. We value your taking the time and trouble to comment. We very much wish the same to you too. Thank you. I, too, have had imaginations of being clever and mysterious; however, I learned at an early age, with hand caught in the cookie jar, it was not to be! Loved the insight into your secret dream world!! Oh dear, caught in the act! No wonder you had your dodgy dealings cut short!! But, yards and yards of divine fabric, trimmed and tasselled to perfection, now that does feature in our dreams!! One of my roommates at University was the daughter of a physician and very well off; she was studying to be an interior designer. Our apartment was beautifully-appointed. It was school housing, but it was new and our little pad was outfitted with very modern touches-- a well-chosen, full-bodied vase without flowers, a stack of perfectly delicious coffee table books, the odd, heavy trinket signed by a name with which I would only later become familiar-- and fully appreciate. She supplied all of these lovely, heady objets. I, on the other hand, canvassed thrift shops with my equally skint boyfriend. She did have one very odd quirk, though. She could never stop pinching my Lucky Charms. I would bring in my favorite cereal and when I'd go to the cupboard to serve myself a bowl in the mornings, seven times out of ten, there would be none! She always promised to replace it, but never did. Then, came the evening when I was never able to feel comfortable in the beautiful apartment, again. We were sitting on the couch, playing confessions and she giggled demurely. 'You see that clock, over there?' she said, offhanded. Such a sad and cautionary tale. And, we are left wondering first how your roommate extracted the Lucky Charms from the cereal box, secondly where did all the things come from and, finally, what became of her. We promise,promise, promise, that we have only ever taken up these nefarious activities in our dreams! What a delightful flight of fancy! I enjoy a literary fascination with crime, but the real thing puts me off my feed. When do you want to visit? Please let me know, I will keep all my doors unlocked and security system unarmed. :) What difference does it make if a painting or a silver bowl move from my home to yours, I can bet they will feel at home in your drawing room too. Perhaps we could arrange for a few swaps? Or, perhaps, long loans? Or, perhaps we could involve a few other people and share things around each others' homes from time to time. Just another form of recycling! We are completely with you!! Flights of fancy are a way of life to us, but, as for the real thing, no thank you. Absolutely wonderful post! I smiled all the way through it. We don't want to admit it, but there is a small dark side in all of us. We might not act on it, but these fantasies are what make good stories and books. Perhaps you are right and that it is our 'dark side' which draws us into the secretly thrilling and mysterious world of novels. Fantasy seems second nature to us, it is the real world where we tend to experience difficulties. Very amusing and I must get a copy of that book. You are very welcome here as I don't have anything worth the effort to steal. I must play this game on nights when I have trouble sleeping ~ what fun! We do recommend that you have a look at Molly Keane if you do not know her work already. Keenly observed and sharply witty, we love them. The list would be too long to write it here of all the lovely things that we have seen in your beautiful home, Adrienne, but always we are taken by the most gorgeous flower arrangements which you have in your rooms. Now they would be whisked over here in the blink of an eye! I have a lovely pile of ironing that you'd be more than welcome to!! Now, we may be amateurs at this but we know when we are being taken for a ride!!! Is it a steam iron, perhaps?!! I volunteer to house-sit the lovely Budapest apartment, putting lights on/off, playing music, etc, for whatever times you require alibis. In our mind's eye, everything, including your view, would be ale to be moved. It sounds like a perfect steal to us!! Touché, dear Fred!! How about tonight?!! A friend and I used to plot crimes we might get away with and always came away laughing our heads off. We're the type to be caught going INTO the bank, with the stick-up note still in our pockets. Ha! There's just something about our faces that screams GUILTY!!! Even before the crime occurs. You are so right, such a fine line at times between the villain and the hero. For our own part, at least by carrying out everything in our imaginations, we get to play all the roles!!! Absolutely! Of course you must be included. After all, you have read more plots, understand crime scenes and know about more weapons, poisons and instruments of torture than we have had hot dinners. Perhaps if you wear the hat lower....!!! What imaginative fun! I am already thinking of a few homes and exactly what I would take. You may come visit any time. City or country house, your choice. Or both if you have the time. Thank you for such a kind and generous invitation. We are now thinking that with so many enticing visits on the cards [so to speak]we shall arrange a world tour for 2013 taking in both of your wonderful homes and those offered by others. We dare say that, after this trip of a lifetime, we shall never sleep again!!! Ah hah! Just as I suspected. I knew you two were to witty to be true. Please, come to my humble abode. start in the attic. Nothing is sacred. Why stop at one or two? When you've finished here I'll give you a couple of "good" addresses. Yes please, the attic. We rather like to imagine what treasures may have been long forgotten there! As for the 'good' addresses, well we are not terrifically good at cold calling, so perhaps if you would be kind enough to organise a garden party, then we can all be introduced!!! Despite this I'm with you on the strict upbringing, my kids are raised the same way. Many happy days to you both! Recently 2 pairs of spectacles, one favorite fountain pen, a packet of dark chocolate biscuits and a nearly half finished piece of knitting (currently over the '2-years-in-the-making' mark) have been misplaced around our house and I now start to think that perhaps they are no longer in the UK...was this a trial run? I would love a life of crime, but don't want the punishment, so I try and be good. Darn it. Thanks for stopping by today at, My Old Historic House. We were most intrigued to find out more about the prolific Stéphane Breitwieser who it appears amassed some 239 works of art, not just in his dreams, but in reality from various galleries and museums around Europe. You are right when you say that it did not seem to be too difficult for him and he seems only to have been caught when he turned his attention to musical instruments. From now on, we intend to specialise! From the little knowledge we have of one of your daughters, we should venture to say that she has grown into a wonderfully creative, intelligent and sensitive person. You must be proud. Definitely not guilty about the knitting. Totally clueless about what to do with wool and needles. Extra spectacles always come in handy we find!! No, we should not care for punishment either. Better by far to stick to the straight and narrow, but dreams will go where they will!! Oh dear, now we fear that we may have revealed far too much here. And, believe it or not, this is just the tip of our imagination iceberg. No wonder we are awake half the night!! Thank you Jane and Lance for that great post. By the way, the life of crime appeals. Can I join your gang? Have you seen Heat? No we have not seen Heat and wonder just what exactly you have in mind for this 'gang' which we now seem to have become!! And, dear Ben, just what precisely do you keep in the attic?!! Looking at the video of the idiotical burglar who B&E'd the house I currently live in, I think I would have been way more successful, had I chosen a life of crime. We promise to be well behaved and Canada is definitely a country we should love to include on our world tour. If it helps our case, then we are certain that you would qualify to join the 'gang'. After all, someone has to got to be the mistress of the dressing up wardrobe so that we are not recognised. Could this be your biggest clothes shopping challenge yet?!! I have no criminal tendencies either, but whenever I visit an art museum, I wish I did. :) Actually, I wish I could move in. There's lava and sage here in plenty. Cedar and juniper, too. I had a good chuckle reading this - thank you for the laugh! It is always interesting to imagine a life of glamorous crime in the vein of Bonnie & Clyde. Speaking of a life of crime, I am reminded of a burglar in the Beaches (which is the neighbourhood adjacent to my house). He would break into people's houses in the early morning, take off his shoes, pad around barefoot (or sock-footed), collecting stuff and often stopping for a bite to eat. He was surprised one early morning in someone's house while helping himself to breakfast! He fled without his shoes, so the police at least knew his shoe size. Oh dear, Christa, what a very poor view you have of us both now. We have never been to Switzerland so it would be good to call....and there were so many lovely things in your house when we last stopped by your blog!!! Hello dear Jane and Lance, I think that you have totally bewitched everyone, they seem to be handing over their swag willy nilly! I love Ron Moody as Fagan, I saw him play the part on stage in London and it was magnificent! Thankyou for your lovely remarks on my last post. Oh dear, I have arrived very belatedly at this delightful post. I absolutely cannot see the two of you purloining anything. Neither could I. I may envy others' their treasures but helping myself to them would be unthinkable. But how about an intellectual exercise where you would work out the best way to rob, say, a bank, or a palace or an art gallery. You could choose accomplices from your own circle of friends, or possibly characters out of books or films. You could employ the latest gadgets or machinery, bribe a high-ranking policeman (money being no object) and use any dastardly trick in the book, provided no person were harmed. Shall we play, I think this is a brilliant idea. We understand exactly what you mean and feel that we could do the same. Indeed, even the basement would do as there are usually any number of lovely things that never see the light of day. No, Mary, offering us Lava, Sage, Cedar and Juniper will just not do, it is the telescope that we have designs on!! Dear Louise, how we laughed about the hungry burglar, although we could see that we might be tempted if there looked to be something really delicious lurking in the fridge! Perhaps our hearts are not really in this after all. Bonnie and Clyde certainly we are not, but driving fast cars has an appeal, we have to confess! You are right, taking the treasured possessions of others could never be a reality. It is, only, the stuff of dreams. But oh how we love the idea of your game.Yes, we can see it all. The plot, the target, the equipment, the getaway, the untold riches,the glamorous lifestyle, the clothes, the jewels......may we play, may we play, bags we go first!!! It seems my question might be...when might I visit? You did mention you were a collector of first editions, am I correct? I think I must, soon, become acquainted with Ms. Molly Keane. And, the game could become a favorite during the holidays. I see two shadows rippling down the wall as two figures clad in the blackest technology advanced textiles descend on steel cables not much more then spider web. Alighting on the flooring with steps so light as to leave to tracks in the sheerest coating of dust. Quietly the two shadow cross treasure after priceless treasure till they are in front of the desired piece. A mere trinket in it’s day, a Rajahs folly. Today the cut and clarity of the stone knows no better. And as the stone slides into the black pouch all one can here is the sound of hardened carbon against silk. The two shadows retreat from whence they came. Passing through rooms darkened with night but they stride with easy grace. Knowing every placement of tables, positions of every chair. In their steely minds the rooms appear as if lit by hundreds of candles. Once again attached to the webs of steel, up, up they go with only a slight whisper of retracting steel as fanfare. Hi to the both of you.Im still laughing at the thought of it all.Also the comments were funny as well.How cheery this was. Thanks for the visit today and the comment I loved about my week being "filled with pennies from heaven".Thanks so much.. I loved that sweet people.Hugs and blessings to you both. Well you had me laughing out loud Jane and Lance! I couldn't imagine where this post was headed...it seemed so unlike you...I must check out this author! Perhaps you should write a book. *sigh* I will send you food parcels to gaol. Your family will be ruined ha ha. Only once was I sorely tempted. I was touring a truly fabulous museum in North Carolina where every room in the house represented a different era in American history. My academic colleagues and I decided to pull our mini bus up to the back door of the museum, and while some of us would divert the guards' attention, others would nick the porcelain, silver art and the paintings. Lucky Charms are cereal. She just often ate it all. Let me see, what became of Nita? The truth is, I don't know. I only lived with her one semester as, at the end of that fall, I was in a car accident, broke up with my boyfriend and decided not to major in Graphic Design, anymore. I came back home to the desert. Carless, without a boyfriend but with a decision to finish my degree in English. And here's your opportunity, if you so wish, to take turns writing out a sentence in your award winning reply to this award winning comment from a Jack Russell dog named Penny. Yes, Penny the Jack Russell dog and modest internet star. You may well imagine robbing an object or two from the human I so kindly allow to live with me. However, in your mind's eye, you see a home that, instead of removing objects, you have this overwhelming desire to fill my human's house with luxurious trinkets and a year's supply of doggy bones. hehe fun post! You'll have to come to my place after visiting Rose, but please please please DO NOT TAKE my Downton Abbey DVD!! i came back to read your answer... i love your reactions to all your comments : ) but i found my comment somehow desapeared... did anybody stole it??? You may come at any time, Bonnie, and will be made very, very welcome, but do not bring a bag! Besides, our books are tagged. Yes, Molly Keane [or M.J. Farrell, her real name] is a most entertaining writer whose flawed characters inhabit a world of black humour. How we have absolutely loved this, the most brilliant of comments, which is still making us laugh as we write this. So, so wonderful, not least the line of the 'note' to be left behind. 'Hattatted' is so superb that we are already making plans to steal it [who cares about copyright when you are in this game??] and use it in a future post! As for a hideout at Fox Paw Lodge, we can think of nowhere better. What fun we should all have. We are so pleased that you enjoyed the post. We do agree that many of the comments which people have written are simply wonderful and have amused us greatly. Your posts continue to give us great pleasure. Thank you. We are delighted, Annie, that this caused you some merriment but are slightly alarmed as to how you may now view us!! 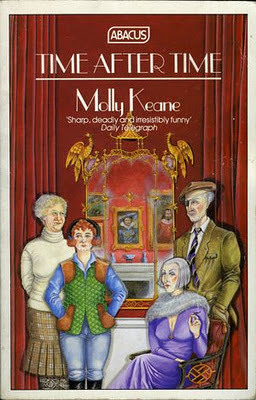 Molly Keane is, in our view, well worth reading with the vast majority of her novels set in decaying Irish country houses in the early years of the twentieth century. Now we are viewing you in a completely different light, Helen, but have loved the thought of you and your colleagues purloining choice museum items into the back of a mini bus. The offer of food parcels is most welcome for we are certain to be caught early on in this new career as, most likely, we do not have what it takes. How ridiculous of us to imagine that a breakfast cereal packet contained all manner of desirable Lucky Charms. We somehow saw it as another example of American generosity. What a disappointment! How horrific to have had a motor car accident and to have broken up with your boyfriend and to have changed courses all at one time. But we think that you made the right choice of English for your degree for it is your natural milieu. We are most honoured to receive a comment from you, dear Penny, of modest [or not quite so] internet fame. Of course you must be supplied with everything, and the very best of it, for your future comfort and, in return, perhaps you would be kind enough to snap at the ankles of any police who may pursue us in our getaway? We are very sorry, but we cannot possibly offer any guarantees!! A 'Downton Abbey' DVD may well be on the list of desired objects but we shall, of course, look to see if it can be acquired elsewhere. It really is too shaming that even comments are now being stolen! What kind of a world do we live in?!! We love the idea of your becoming a new Robin Hood and with all those wonderful trees and woods at the end of your garden, you would not need to look far for a Sherwood Forest. Do try. It certainly helps on those occasions when sleep eludes! And you are so right for, almost certainly, they would have to be vintage wheelbarrows as opposed to those ghastly moulded plastic ones. I have a theory about you two, I think you are cat burglars and international jewel thieves, how else can one account for your jet setting ways. 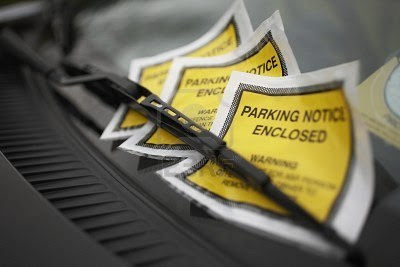 For my part, I have a confession to make, I never pay parking fees. I am wanted by the law to the tune of about 4 tickets at this point. It is something in my psyche, I refuse to pay, to hell with the Council! In exchange for your keeping quiet about our activities, then we will not 'snitch' [if that is the correct term] on you to Bristol and Avon Council or whoever it is to whom you owe the princely sums. Would you consider a partnership? We could make use of the kind of speed boat to which we know you have access. You are Welcome anytime:) I have read the book - 'The great train robbery'. What a fascinating read it is. And this is an equally fun post!! Brilliant game...I shall play it this afternoon with Laughing Boy. We shall bear this in mind!! In the meantime, could you forward a list of contents?!! 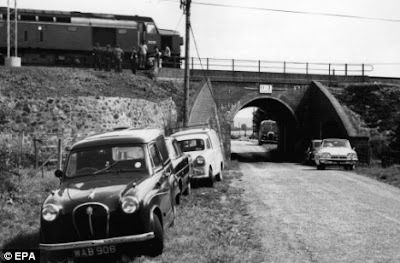 Alas, we are old enough to remember the Great Train Robbery which caused a huge stir and was, we think, the largest haul, somewhere around £2.3 million, ever at that time. Thank you!! If not this afternoon, then it certainly helps to while away the hours when, for whatever reason, you are unable to sleep. We trust Laughing Boy will find it mildly amusing!! Well, of course, it all takes place in our minds, Dee. We should never be bold enough to carry it out in reality, not to say, too concerned to keep our friends whom we value so much! Tempting us with cake....we shall be there! Jane and Lance, you’re welcome anytime. Please let me know when you’re coming and I’ll keep one window open as all the windowpanes of my house are very strong impact resistant glasses and the entrance has double locks of Kaba. Once inside, probably you’d regret your travelling overseas as far as to this far east. Oh, please don’t disappear with my computer. I’d become like a witch who lost a wand. On your back, be sure to stop by Nara Park to stroll through the history and have fun with deer there, for which you’ll never ever regret. We should, we are sure, never regret the travel to the mystical and magical East of Japan to visit you, dear Yoko. We just know that we should be entranced by it all, particularly Nara Park of which you write so tenderly and beautifully and of which we never tire of looking. Now, we have to say, that a computer each might well be something we should be looking out for. The one machine becomes quite crowded at times!!! However, clearly you would be bereft and, as you have made sure that we do not have to do any breaking before entering, we shall be quite happy to just join you for tea and a stroll through the park. How lovely that would be! I do believe you both need a visit to the "Confessional Box" We were told if you entertained a bad thought, (or as we children said, if it entertained us) then this is a venial sin and must be confessed. Seeing as you were unaware, I will absolve you of your sins and for your penance, please do an extra post this week. Dearest Sister Helen, we feel SO much better now. "Better out than in", as our mothers used to say and, with your kind absolution, we can now dance a merry dance again around the drawing room. Of course, if we could just discuss our 'problems' with you personally in Canada whilst viewing some of your wonderful paintings, then we are sure that the repentance will be complete!! Well well Jane & Lance, I dropped in for a cuppa as I take a ciggie break from drawing a Sphinx from the Acropolis and began the post giggling, then chuckling and then laughing heartily. The giggling began at your fencing fakes! We are so pleased that you have been amused during your break! Fencing fakes, now surely, that is something you should, with your insider knowledge, be able to help us out with?!!! We should love to see the photograph and the jewellery chest will be such fun to look through when we meet for tea in The Garrett!! Well, Diane, as we see it, what is good enough for the Bank of England is fair game to us! You had me worried for a very short split second there you two!! I thought the 'other side'... the 'To Catch A Thief - other side', of our beloved Hattat's was about to be revealed, but lo and behold...it's only your whit, and sharing of a bit of fun that has been exposed, thank heavens! Ha ha, what a fabulous hobby. And you wrote your post so well! Your thieving idea is so great, today on my way to work i "entered" a friend's house and "took" their sofa!!! When I read this post, I was smiling at first, and then I began to laugh :D This isn`t because I don`t believe you to be capable of committing a crime. It`s just that, if you planned a crime, it would also be extraordinary, I`m sure. I think that a few European governments should allocate you a pension or a pair of orders just for not going down a criminal path. I enjoyed reading this so much, thank you. You write so beautifully and it really did make me laugh. I never considered a life of crime either, except for working in banking I suppose! Annie x.
Oh my goodness, you two are hilarious. Thank you for sharing your view of the world...with the world. Happily, Jessica, we do not think that we were cut out for a life of crime and had we been, then we should most likely have been caught and have had to spend a considerable time in prison. Not a pleasant place to be. As it is we are free and the possibility of one day meeting up is open. And what fun that would be. We consider you to be a 'natural'!! Anytime you would care to join the gang, then let us know - we could do with some representation overseas. The truth is, we think, that when it came to it we should be totally hopeless and could not bear to think of the unhappiness it would cause to other people. We should most likely find ourselves returning things. But the idea of additional pensions appeals greatly. Would Canada contribute, do you think? We are so pleased, Annie, that it gave you something to laugh about. Now, banking, once considered the epitome of a professional career is, these days, becoming very suspect!! Do you, by the way, have any 'inside' knowledge?!! How very kind of you, Paula. Welcome to the blog and we shall very much hope to see you again. Do you, by any chance, have a swag bag we could borrow?!! Molly Keane is indeed one of our favourite novelists writing as she does about the Anglo Irish in the early years of the twentieth century. Her characters are always flawed in some way or other, as are the large, crumbling mansions in which they live. Now, if we could 'steal' a view, that would be lovely. My goodness, thank you for the laughs!! Oh, how I would love to read more!! And you, dear Irina, are so very kind. We thought it made for a little light relief after the traumas of asbestos!! Ha Ha:))) Oh I so needed to laugh this morning! He he...Jane and Lance,..... You have stolen my heart! That is one of the nicest compliments that we could wish for, Jane. Hoping your day will bring you many more laughs!! Thank Y'all SO much for your kind words and inquiries of late---and this particular cheery romp gave me some smiles (especially after the desolation of the Kastely's sad report). I look forward to your bright wit and lovely photos, and am honored that you shared such inviting glimpses into your own home. Mine is mostly disarray this moment, for attacking five tasks-to-be-done all at once, with no regard for clutter or dust---that is my downfall. We are to have either eleven or sixteen to Thanksgiving dinner, and things are progressing slowly, slowly. Having the menu posted on the fridge gives a nice air of coping, but I must stay with it, or we'll be dining on paper. Many thanks for thinking of me!! PS you are welcome to take your "pick of the litter" as it were, from our troves of stuff, mostly from Goodwill and yard sales---though useful or pretty or just because---you could get clean away with anything but the stove, and we'd never notice. How lovely to hear from you, dear Rachel. We were so concerned about you having read your last posts so we are delighted that our piece of escapism has cheered you. As the numbers seem to be flexible, please may we attend the Thanksgiving Dinner too? All that wonderful southern home cooking would be more than treat enough for us after our long journey to you! I wouldn`t want you to have unrealistic expectations in regards to Canada. The best you can hope for is, after many years of volunteering at the Toronto Public Library, is a thank you note around Christmas. Oh how I can see you both now, the modern Bonnie and Clyde, tingling along and sneaking away half the wealth from those oddbod bankers and giving it to the poor. Along with a few cakes too, lovely. I'll join in too, although, I think I'll be just guilty of receiving stolen goods! Oh dear and we did allow our hopes to ride high!! Still, better remuneration than at the Contemporary Art Museum in Budapest where, after paying for the training and giving several months of free guided tours, we were all told that we were no longer needed and that was that! My dear Jane and Lance, what a delightful post! Thank you so much for introducing us the novels of Molly Keane. 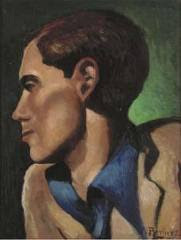 I didn't aware of this writer until a few years ago when I read this following book: "Looking Back: A Panoramic View of a Literary Age by the Grandes Dames of European Letters" by Shusha Guppy and introduction by Anita Brookner. And Molly Keane was one of the writers who was interviewed for the book. Her life like her characters in the book was the most fascinating. Only Bonnie and Clyde in our dreams, we fear, but we are delighted that you might think it just about possible. Amazing imagination you must have!! We do rather fancy printing banknotes, just Quantitative Easing by another name, don't you think?!! How good are you with pen and ink? Crikey, I'm a long way down!! Your posts are a delight Jane and Lance but I did wonder where this was going for a moment...! What I love especially about your blog is the wonderful array of comments and the subsequent replies your entertaining (and in this case 'nudge, nudge') posts elicit - they are a joy in themselves. I love Molly Keane and shall keep an eye out for this one - looks like a great read. Molly Keane's novels are firm favourites with us. Good Behaviour was the first to take our attention and from then on we were hooked. We are so pleased that you enjoy reading her too. Her characters are so carefully observed and well crafted and they are almost universally flawed and with a dark side. An intriguing combination in our view. Thank you, Jeanne, for your kind words. We too eagerly anticipate our readers' comments since we always find them to be incredibly lively, imaginative and wide-ranging. One never knows quite what to expect and that is how we like to write too!! We are delighted that you like Molly Keane and can certainly recommend 'Time After Time' for your reading list. You'd be SO far beyond welcome!! I don't know if you've ever participated in the holiday in the U.S., but Southern Thanksgiving is a little removed from that---only a little, but with a richness of atmosphere and food that will leave you ready for an afternoon nap, then later avid for a scrounge midst the leftovers for another taste before bed. though I do not hope to do such a table this year. Four little ones claiming my attention will be MY pleasure, and I'm sure much of the preparations will take back seat to my selfish wallowing in all that wonderful playing and crafting and teas we try to cram into the few times a year they can be with us. We'll set your places, just in case---do you prefer the grown-up version, or at the Kids' Table---with ME? Ha ha, i'd be happy to join your Bonnie and Clyde outfit. I imagine we would get away with a few interesting goodies. Hugs to you both for the sweet visit.Blessings! Not only have we never participated in Thanksgiving US style, we have not yet visited the USA!!! Now, we are seriously contemplating a tour of the country stopping off at the homes of fellow bloggers on the way. Your 'southern special' dinner sounds absolutely wonderful. We should be happy to eat with the adults or the children since it all sounds so much fun and shall follow the link to see what it was like last year with you! We wish you and your family the most joyous of Thanksgivings!!! Jolly good!! Now, what is your particular speciality? Perhaps you could persuade some of your students to act as decoys for our escapades.......and, they may have insider information we could use. Whatever, your ability to rustle up a delicious snack to warm ourselves whilst on stake-outs [is that how they are spelled? ]would be invaluable!!! We so enjoy our visits.Take care! Jane and Lance - I have nominated you for a Liebster Blog. Congratulations! Have a look at my blog! I'm late to the party here, are there any appropriate witticisms left to be aired I wonder. We do not fear the purloining of our belongings, thieves visiting our home would be so busy fending off excited whippets who'd be trying to bounce on said thieves heads and would have no opportunity to pilfer. Dear Jane and Lance, I do apologise my comments seem to be vanishing off into the ether! I shall try again. Firstly, thankyou for your lovely comments on my post, they just make my day! Secondly, I did have a good laugh when I read this post, you really are a mischevious pair.I am quite astonished at how you have managed to bewitch everyone into giving up their swag and priceless art works! I did enjoy the clip from Oliver too, I love Ron Moody as Fagan, I saw him play it live on stage, when I was at school, it was fabulous. The Bonnie and Clyde of the book pilfering variety - I can see it. You are welcome in Helen's home and around her silver as Helen is a gracious hostess unafraid to give a suspect visitor a brisk patdown before they depart (and after that, some might even want to stay! Ole!). Hello, Jane and Lance Hattatt. Thank you for your love and sincerity. The traditional celebration, with kimono infants. Japanese colored leaves, in heartwarming space. Christa, this is so very, very kind of you and we are most touched. We should be so distracted by the whippets, who we know we should immediately love, that we should immediately forget the whole purpose of the visit and simply enjoy playing with them. We blame it all on Blogger!! It is definitely not we who are reduced to stealing comments - much bigger fish to fry, as they say. Have you any coffee or tea cosies lying around, perhaps?!! How absolutely splendid to have seen Ron Moody who, we think, is the best Fagan of all time. Wonderful, and we are so pleased that you enjoyed the clip. On balance, dear Helen, we shall most likely pass where the silver is concerned fearing the 'pat down', as you somewhat euphemistically refer to it, as something which could be seen as major blows. But a legendary Martini with you would be such fun. Warmest wishes from Eastern Europe. Of course, I know that you have more than 200 followers. BUT your blog is so animating and amusing that I HAD to add you! So in this sense I just could not stick to the rules... and I NOT sorry! ;o) Have a beautiful day. Dear Christa, how kind of you to bend the rules on our behalf! We shall look up the other blogs you mentioned as we have not heard of them before. Thank you once again for including us, we are honoured and thrilled. "The great train robbery" Ronald Biggs!, if i remember correctly. died some years ago, in England. I was in Australia at the time.. It was the most incredible heist.. The whole country was a buzz ..buying up all the newspapers on the stands. Your super blog on "Crime" is great. It cunjours up images of "Fagin" in his tipless gloves, hovering over his "cache" of silver, jewlery and other things ..and poor little Oliver. No Silver in this house.. but you are welcome . I have been reading your blogs and decided it was time to follow.. best wishes for a good day. Welcome! We are so pleased to see that you have signed up as a Follower and hope that you will continue to enjoy what we write. You are so right about the Great Train Robbery causing endless excitement for months and even to this very day the audacity of it does inspire in a strange kind of way! Portugal is a country we have yet to visit, so we are grateful for the invitation. No silver necessary, but fresh olives from your trees would be perfect! Thank You very much for Your beautiful comments! And, thank you too for your stunning photographs! I seem to remember you eyeing up a blue and white ginger jar, I'll have to nail that down when you come to tea!